One of the holiday offerings at Starbucks is a mocha that is a spinoff of their new Signature Hot Chocolate: the Espresso Truffle. It’s the hot chocolate combined with a shot or two of espresso. The hot chocolate alone is much richer tasting than the chocolate syrup they use for their regular mochas, and I recreated that feeling for this homemade version by adding melted chocolate to regular hot cocoa mix. The extra cocoa butter from the chocolate makes the drink creamier and more chocolaty, without just tasting like you dumped too much hot chocolate mix (and sugar) into your cup. You can either use a shot of espresso to finish of your drink, or use a little less milk and substitute strong coffee. It makes a delicious – and fairly decadent – drink for a fraction of the cost of going to a coffee shop and not much more effort than you would use when adding regular milk and sugar to coffee at home. This drink makes one serving, and since most mugs hold about 10-12 ounces, I’m using measurements that make more than the “Standard” 8-oz drink. Fee free to play around with the proportions if your mugs are bigger or smaller. If using coffee, use half milk and half coffee for the drink. 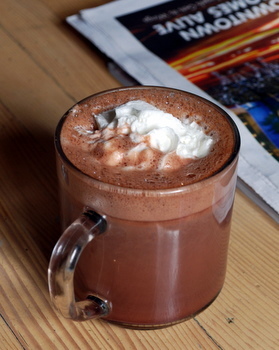 In a mug, whisk together hot milk and chocolate until chocolate has been fully incorporated and mixture is smooth. Whisk in hot chocolate mix and stir well. Top off with shots of espresso and a dollop of whipped cream, then serve immediately.